Gallaudet won its football game this past weekend against Castleton State College in Vermont. The Bison racked up about 448 yards rushing, spoiling the Spartans homecoming. The final score was Gallaudet 49, Castleton 18. The Bison is now 2-2 for the season and 1-1 in conference play. Sophomore running back Phillip Hayes scored three touchdowns. Quarterback Jimmy Gardner earned Eastern Collegiate Football Conference Player of the Week honors two weeks ago in Gallaudet's 34-7 victory over Hiram College of Ohio. The roster has players from 32 different states. Troy University will get $1.5 million over five years to fund deaf interpreters training program offersing a bachelor’s degree in education for interpreters. The money will come from the Alabama Dual Party Relay Board which was founded more than 20 years ago to help the deaf receive telephone service. The program will be available through distance learning, allowing students at Troy's satellite campuses to enroll in the program. The university hopes to eventually establish a center on deafness at the Troy campus. The program was started last year with a quarter million dollar grant from the Alabama Department of Education. There were 25 people enrolled for the first year and about 100 this year. There are about 40,000 deaf people in Alabama but only about 200 licensed interpreters. A deaf software engineer at Google, Ken Harrenstien, is heading up the creation of a captioning tool for videos posted on Google’s YouTube site. The auto-translation software can also help translate languages, allowing people to add captions in 50 languages as they upload video to YouTube. Gary Small has joined the Bowie Theater Company for the production of The Kitchen Witches this weekend on Crain Highway in Bowie, Maryland. He’s the company’s first deaf actor. A senior at Eleanor Roosevelt High School in Greenbelt, Maryland, Small helped in the school’s production of Footloose last year, is involved with the production of Neil Simon's Rumors this year and wants to pursue theater professionally. AT&T is upgrading its instant messaging service to allow real-time communication between callers. The company began offering its Instant Messaging Relay services early this year. It allowed people to communicate using AIM with the help of an operator over the telephone similar to TDD devices. The upgrade makes it work instantly without having to wait for an operator. Two Northern California deaf men are facing charges they tried pretended to raise money for a ball team that didn’t exist. Ferndale police say they believe the pair wanted to use the funds to buy drugs, making up a story about a deaf baseball team needing money to go to a tournament in Florida. They men had created pledge forms using the name of a legitimate deaf associated and asked for $5 donations. Ohio State now including captioning during its football games on scoreboards and stadium televisions to help the deaf. The new service began with the teams opening game against Illinois. It includes all public-address announcements and play descriptions, as well as calls by the officials. The National Association of the Deaf got the school moving on the issue when it sued this year on behalf of Buckeye fan Vincent Sabino. A state budget committee has voted against closing or merging the Kansas School for the Deaf and School for the Blind. Members say it would cost more to put the schools together than it would just leaving them as they are now. The Kansas School for the Deaf has a budget of nearly $10 million. It serves 135 students. A deaf medical student is suing Creighton University, accusing the Omaha-based school of refusing to provide him proper hearing assistance technology. Michael Argenyi has been deaf since infancy and has repeatedly requested specific accommodations. Not only was he turned down before and after he was admitted to Creighton but he claims he was offered outdated technology. Creighton is only willing to provide a note-taker and an amplifier. Argenyi wants the school to provide Communication Access Realtime Translation and and cued-speech or oral interpreters for labs and small groups. But administrators say third-party interpreters are a violation the school's technical standards. State May Take Over School. The state government may take over the Rhode Island School for the Deaf because of poor leadership, teaching, technology and low test scores, according ot the education commissioner. Only about 10% of the students scored proficient in reading and none scored proficient in math. The school has had four different directors in the last 8 years. A decision will be made at Thursday's board meeting. Children of a Lesser God is now being performed by Deaf West. This 30th-anniversary production is presented in American Sign Language with spoken English and supertitles, making it fully accessible to both hearing and deaf audiences. The Los Angeles Times calls the production earnest, occasionally clunky and a little too long but shows the durability of the landmark drama. Children was first performed on Broadway in 1980 and turned into a film in 1986. See it at Deaf West Theatre in North Hollywood through October 18th. Researchers in Louisiana and Texas are using RFID-tagged toys to teach ASL to deaf preschoolers. The system is known as LAMBERT which stands for Language Acquisition Manipulatives Blending Early-childhood Research and Technology. It was designed by Southeastern Louisiana University in Hammond, Louisiana. Thanks to a grant from the Department of Education of nearly $400,000, the program has been expanded. The system includes a kit with a laptop or desktop PC along with 25 objects with radio-frequency identification tags attached to them. When a child sweeps the tag, a short video pops up on the screen with a person giving the sign for the word. It also speaks the word. A kit with 500 items is under development. It’s being used at the Louisiana School for the Deaf and the Jean Massieu Academy in Texas. School officials say it is the only community college program in the world designed for deaf and hard of hearing. The Southwest Collegiate Institute for the Deaf serves about 100 on the roster with about 50 faculty and staff trained in sign language. The west Texas school gives students career and technical training. And this year, it added a new athletic program. There will soon be a men’s basketball team and a women’s volleyball team. WHNS-TV in Greenville has this report on the South Carolina School For Deaf and Blind in the station's "cool school" segment. An Iowa deaf man has settled his legal battle with two Minnesota counties. Latell Cheney sued Martin and Nobles Counties was arrested after an automobile accident, interrogated by police through handwritten notes. Cheney spent six months in jail without access to a sign-language interpreter even though he asked for one. He gets $25,000 from Martin County and $50,000 from Nobles County. In 2007, Chaney was convicted on all charges but his conviction was overturned on appeal. Kevin Hall is one of 120 golfers in Augusta this week for the Kandy Waters Memorial Hooters Tour event at Gordon Lakes. Hall is deaf and became the first black man to receive a golf scholarship to the Ohio State University. While at the school, he led his team to a Big Ten title. The Cincinnati native is working his way onto the PGA Tour. Sheriff's deputies saved the live of a deaf woman in Neillsville, Wisconsin thanks to 911 mapping technology. Emergency dispatchers could not understand her frantic 3am call Monday morning. She was trying to tell them she had rolled her vehical in a ditch off a highway. They tracked her location using the new technology and firefighters were able to extract the woman. A school formed by the merger of two Minnesota schools for deaf children will hold a "grand opening" and ribbon-cutting ceremony tomorrow at the new facility in St. Paul. North Star Academy in Faribault moved it's 9th through 12th grades to the expanded facility originally occupied by the Metro Deaf School and its K through 8th grade classes. The nearly 100 students attending the new school will enjoy a new gym and classrooms for the upper grades. A name hasn't been selected but the bilingual school will teach students both American Sign Language and written English. The Oklahoma State Fair will observe National Deaf Awareness Week this Thursday. Those working in the field will offer information while members of the Rehabilitation Services Department will perform songs and skits in American Sign Language. WTTG-TV has the story of three deaf-blind persons locked in a hot van in Frederick, Maryland. Police were not able to locate their caregiver right away, so they broke into the car in order to let the victims out. Police in Huntsville, Alabama found a deaf man injured in his home today - with two armed suspects inside. The two men were arrested and face charges of home invasion, robbery and assaulting the man. A video overview of this year's Deaflympics in Taiwan. Video from the Deaflympics of American wrestler Nathaniel Garrels from Iowa (in blue). Debi McRae has authored a new children's book called A Silly Worm Story. This amusing tale about six worms who meet each other as they come out of the rain soaked ground will be featured in the Pennsylvania Library Association Book Exhibit in Harrisburg next month. McRae lost her hearing at the age of two when she contracted the measles. Her older sister, Donna, who is also became deaf at an early age illustrated the book which is self-published. For more information go to this site. A deaf dancer auditioned for season 6 of So You Think You Can Dance. Allison Becker tried out in Phoenix, Arizona. The deaf contemporary dancer showed her skill to the sounds of The Fray's You Found Me. When she finishes her routine Nigel blew her kisses and signed that he loves her. He told Allison she lacked some technical skill, but her dance was beautiful and moving. Mary Murphy agreed and burst into tears, saying "Though I am crying, I want you to know how happy you just made me." She told the audience her cousin is deaf, so Allison's passion really touched her. Allison was given a pass to Las Vegas and assigned choreography. Her response to the judges: "I'll be great in choreography!" Here's a video with her (captioning included). The University of Cincinnati is getting a large grant to develop technology that would help health-care staff members better interpret speech. Most of the $850,000 funding from the National Institutes of Health will go toward creating neuroscience researchers software to screen speech patterns. But some of the funds will go toward developing a speech-monitoring device to help the deaf communicate with others. Video of fireworks at the closing ceremony of this year's Deaflympics in Tawain. A video of the Men's Soccer team from Ukraine celebrating their victory over the Russian team by a score of 3-2, giving them the Gold to close the 2009 Deaflympics. Here is video from the 110 meter hurdles at the Deaflympics. There were 76 deaf and hard-of-hearing students playing NCAA and NAIA sports in 2008, according to Deaf Digest Magazine. Nearly 40 played in Division I. That does not include the athletes who do not want to be identified. A group of Christian missionaries are fanning out during the Deaflympics in Taiwan. Silent Word Ministries International is an international evangelical organization focuses on outreach for the deaf by working with area churches. They are handing out gospel tracts near venues where the games were held with help from 20 other Taiwanese Christians belonging to sign-language Baptist and Presbyterian churches. The organization also brought along 10,000 multi-language DVDs and 20,000 gospel tracts. Silent World says there are at least 7 churches in Taiwan with members with hearing disabilities. Of these churches, only 2 are officially churches for the deaf or sign language churches. A women in Mesa, Arizona is in jail for attacking another woman who's deaf daughter starred at her so she could read her lips. Tonya Goodson and her children were shopping at a store when Viniecia Jordan became enraged because the preteen kept looking at her. Jordan demanded Goodson "put your b--- daughter in check" and told Goodson "your daughter does not look deaf." Goodson tried to walk away but Jordan jumped on Goodson's back and began punching Goodson in the face and strangling her, knocking over the stroller of Goodson's one-year-old daughter who was scrapped and received a concussion from hitting her head on the sidewalk. Jordan is facing aggrevated assault charges. In this long article, USA Today takes a look at deaf athletes in the university ranks. Here's a video about one of them. The US Men's Basketball team has won the Gold Medal by beating Lithuania 90-73 at this year's Deaflympics. America has won the basketball tournament at every Deaflympics since the game was added in 1957. Michael Saalfeld took the Men's 800m for the US. Russia earned Silver and Mexico took Bronze. The Ukraine won the Men's 4x400m Relay and the US took Silver. Here's a video from Deaflympics showing the badminton competitions. Here's a video from Deaflympics of the German bowling team. Maryland's Fort Washington Medical Center has agreed to provide interpreters for deaf patients. It's part of a settlement between a deaf patient and the Department of Heath & Human Services. The problem started when a deaf man came to the Medical Center's emergency room with his son. He requested an interpreter but none was provided. The medical staff decided to let the 11-year-old boy interpret for his father. He later filed a complaint with the Office for Civil Rights which found that Fort Washington Medical Center had violated the Rehabilitation Act of 1973. Medical facilities are requied to provide qualified sign language interpreters rather than depended on family members. The Women's US Soccer team won Gold at the Deaflympics in Taiwan. They beat Germany 4-0. Meanwhile, the Ukrainian team beat the US in Women's Volleyball in three straight sets. The American team clained the Silver which was an improvement over its Bronze metal finish in 2005. The US lost in straight sets to the Ukraine in Women's Volleyball at the Deaflympics in Taiwan. The Americans earned a Silver medal. They took a Bronze in the last Summer Games in 2005. The US Women's Beach Volleyball team also lost to the Ukrainians who go on to play for the gold. On the men's side, the American volleyball team won their semi-final matach and will face the Men's Ukrainian team in the finals. The US basketball team beat Greece 64-57, the smallest margin of victory so far for the Americans. The Americans have now won five games straight. Here's a video showing the Russian team winning over the Ukraine at the Deaflympics. Here is a video of the Russian team at the Deaflympics. Maryland's pension system overpaid 45 retired employees from the Maryland School for the Deaf. They were given a total of $487,000 too much over a period of 22 years. The state will probably not ask for the money to back. But future retirees now know they won't be getting as much money as they thought they would. State officials blame miscommunication between the State Retirement Agency and the Central Payroll Bureau which wrongly classified 10-month non-faculty employees of the school as working for 12-months out of the year. If you are a deaf or hard of hearing college student you have rights under ADA that the school must honor. In this video, Danny Warthling talks in ASL about ADA law and colleges. The US Women's Basketball team beat Lithuania by a score of 67 to 62 at the Deaflympics. That puts the Americans in the championship match. American Amber Lynn Nash took the Bronze in Women's 110m Hurdles. Craig Saalfeld lost his lead in the Men's Decathlon to a Russian competitor, walking away with a Silver. The US beat Japan in Woman's volleyball by a score of 3-1 at the Deaflympics in Taipei. The Americans now move on to the Finals where they will take on Ukraine. American Craig Saalfeld increased his lead over a Russian competitor in the Decatholon after eight events in the competition. Some 50 members of the deaf community gathered to demonstrate against planned budget cuts at a state Capitol hearing in Hawaii yesterday. The Deaf Services Section of the Vocational Rehabilitation serves several hundred people. The overworked staff is being cut and the offices moved to a less disirable location. The deaf services program has been in operation for a dozen years. The California School for the Deaf Eagles won their 1st football game of the season by a score of 33-0 last night. The Eagles defense had two fumble recoveries against Valley Christian-Roseville and three interceptions, including one for a 75-yard touchdown return. Here's a video about ADA law and housing. Although few of the athletes competing at the Deaflympics make a name for themselves outside of deaf sporting competition, there is an exception. A South African swimmer earned a silver medal in the 200-meter breast stroke at the 2000 Summer Olympics in Sydney. Terence Parkin has switched sports for the Taipei games and is competing in road cycling. A former student is pleading guilty to charges he called in a false bomb threat to a New York high school using a TTY connection. Shawn Parsons was serving in-school suspension at Auburn High School when he sent the false threat. Prosecutors agreed to give him probation and time served if he would plead guilty. Parsons has been in jail all but one day since the incident in May. He'll be sentenced in next month. The US advanced to the Semi-finals in Men's Basketball at the Deaflympics by putting up 100 point against Spain. American Craig Saalfeld leads the Decathlon competition after the first day of competition. In Women's soccer, the US beat Great Britain by score of 2 to 1. Here's a video about tax incentives to help businesses become more accessible. Computers are now better at lip reading than humans, according to a new study out of the University of East Anglia in Norwich, England. A machine-based lip reading system significantly outperformed more than a dozen human lip readers during tests. The recognition rate was only 32% for the human lip readers. But the computers figured out what was being said about 80% of the time. Unlike the people involved in the test, the machines didn't need to see the full face of the speaker in order to do well. Scientists say the information they've gathered suggests there may be some novel ways to quickly improve lip reading. Researchers will present details of the study at the 8th International Conference on Auditory-Visual Speech Processing that starts today at the University of East Anglia. American Amber Lynn Nash took the Bronze in the Women's 400m Hurdles at the Deaflympics in Taiwan. The US failed to make it to the semi-finals of Men's Water Polo. Ireland beat the US by a score of 27-6. The Alabama School of the Deaf beat Coffeeville High School in football by a score of 44-20. The Silent Warriors scored on their first possession of the game and never looked back. This video covers what to do when encountering law enforcement. The FDA has approved the newest implant from Cochlear Americas. The Nucleus 5 System is designed is for those with severe-to-profound hearing loss. It's the smallest and thinnest cochlear implant, so far from the Australian-based company. Cochlear also reported today that it has lifted its annual profit by 13%. Onyemachi Davis of the US was second best among the 22 participants in the preliminaries of the Men's Discus Throw. The US beat Brazil in Men's Beach Volleyball at the Deaflympics today. The final score in the preliminary round was 42-17. A deaf man in Maine claims Augusta police twice refused to provide him with an interpreter after he requested one. An investigator for the Maine Human Rights Commission has sided with Wayne Draper in his case against Augusta. The Commission next meets two weeks from today. This could be grounds for a lawsuit against the city which claims there was no harm done because Draper was able to communicate in other ways to officers. Police stopped Draper in 2007 for taking someone's vacant hunting stand. He showed the investigating officer card that said he wanted an interpreter but Draper claims the officer refused and wrote a note to him. Draper was never charged with a crime and the tree stand owner physically threatened him. Police again refused his request for an interpreter, eventually providing one for him at the police station later after Draper was insistent. Here's another video where Danny Warthling talks about when to request a sign language interpreter. Randall Wayne Perry of the US won the gold medal in men's bowling singles with 1228 pins at the Deaflympics. The silver medal went to a Korean athlete and the bronze medalist was Malaysia, 1188 pins. The closing ceremonies of the 21st summer Deaflympics will include a large open-air banquet in Taipei. The focus will be Taiwanese delicacies like beef noodle, steamed dumplings and oyster omelet. Theatre director and playwrite Stan Lai designed both the opening and closing ceremonies. Deaflympics' rules state that the final soccer game must be played at the main stadium. That means he'll have only two hours to put everything in place. This will be the first time an International Olympic Committee sanctioned event has ended with a serving of banquet. There will be about 300 tables for the athletes while the spectators (numbering about 15,000) will be given a box of food. During the meal, music, dancing and singing will fill the stadium. Here's video report about the first day of school at the old Scranton State School for the Deaf in Pennsylvania. A private company now runs it. Joanel Lopez won a gold medal for the US in the shot put at the Summer Deaflympics in Taiwan. Lopez is a Brooklyn native and graduate from New York's Binghamton University. An athlete from Turkey came in second. Lopez will next compete in the hammer throw. China's Deaflympics delegation is giving more than $73,000 to victims of the recent typhoon that struck Taiwan through the Red Cross. The storm ravaged the island nation last month, triggering massive flooding and landslides. Several remote mountain villages were wiped out. The storm had left more than 600 people dead. The Taiwan organizers of Deaflympics are coming under fire for disorganization. One of the most often heard complaints is about transportation. Both athletes and journalists are having trouble getting to the venues located in and around Taipei from the 36 hotels in which they are staying during the games. Some countries have gone so far as to hire private vehicles to make sure they get their teams to the proper locations on time. There have also been complaints about incomplete information appearing on the Deaflympics website and there are accusations that the posted information is incomplete, tardy and bias toward the Taiwanese team. Although the country spent $6 million on the games, there are also a variety of problems with the competitions themselves. For instance, the Taipei Stadium swimming pool has only 8 lanes when Olympic-size pools should have ten. That's forced athletes to drive two hours out of town to swim in a back up pool. In this video, Danny Warthling talks when to request a sign language interpreter. Taipei has gathered thousands of volunteers to help with the Deaflympics Summer Games. There are 9,763 Twainese playing hosts. They are helping with tranlations and sign language, even guiding traffic. Many are college students. Helen Keller International is getting more than million dollars for its work its efforts to prevent blindness in the developing world. The money comes from the Champalimaud Foundation's annual Vision Award. The New York-based nonprofit will recieve $1.4 million in total from the private Portuguese foundation. Hellen Keller International was founded nearly 100 years ago and operates programs in 21 countries. The Champalimaud Foundation is financied from the estate of one of Portugal's wealthiest businessmen. Antonio Champalimaud died in 204, leaving a quarter of his billion dollar estate to the foundation after he lost his sight during the last years of his life. This video is an overview of ADA in ASL with RJ Roupp. The US Deaflympics women's basketball team beat the Taiwanese team 96-14 in their opening round. If the US wins the tournament, it would be the third straight time the Americans have won the gold. The US men's soccer team played the Japan team to a tie. Both teams still have an opportunity to advance. They take the field again tomorrow. On the women’s side, the US shut out Germany 4-0. The new Jennifer Aniston film Love Happens has an early scene in which she pretends to be deaf in order to avoid talking to a self-help guru when he arrives in Seattle. The movie opens on September 18th. Here's the scene. A new device is giving the deaf-blind a way to communicate with anyone. The idea for two-piece portable device called the DeafBlind Communicator came from Washington State’s Office of the Deaf and Hard of Hearing. A decade ago, program manager Colleen Rozmaryn wanted something to replace Tele-Braille devices but couldn’t find anything that would do the job. That eventually led to the development of the device built by a Canadian company called HumanWare. 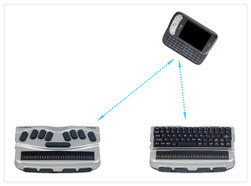 The DeafBlind Communicator provides a trio of communication devices in one package: face-to-face, TTY and SMS. It combines the BrailleNote with a DB-Phone. There is a laptop-size device with two keyboards along with a second, smaller device resembling a PDA. The deaf-blind person gives the smaller device to a non-signing person. It displays a message on the text screen and through speakers at the same time. The return message is then converted into Braille. The deaf-blind person reads the message by touching the a smaller set of keys on the larger device. Washington State has bought 35 Communicators for $6000 each. Click here for more information. The 21st Summer Deaf Olympics are underway in Taiwan. Yesterday's 12-part opening ceremony included Taiwanese pop star A-mei, Chinese martial arts actor Jet-Li and choreographed performances. Many of the performers were deaf. Taipei's Mayor spoke of the victims of the recent typhoon. Taiwan's president, Ma Ying-jeou, was also in attendance at the opening ceremonies. The Chinese team did not march in the procession of athletes. Instead, a single athlete carried the country's flag. China blamed the absence on a scheduling problem but many believe the move was deliberate because Beijing frequently objects to Taiwan's participation in international events. A record 4,000 athletes from 81 countries are registered to compete this year. Atlanta police say they are outraged by the sentence given to a deaf man with Aids who bit an officer during a struggle. Ross Deadwyler was given five years with only 18 months to serve but Police wanted him to get 15 years with six years to serve. A chase through Atlanta streets a year ago hit speeds of nearly 100 mph before a pit maneuver ended Deadwyler's wild ride. When he didn't obey their spoken orders, the officers tased him. Deadwyler pled guilty and the judge says he took Deadwyler's condition into account in his sentencing. The officer did not contract the disease from the bite. See the chase and a video story here. An auto body shop in Springfield, Missouri was a victim of a TTY scam. WWLP-TV has this video report. You can read the story here. The Justice Department has filed a lawsuit against Ventura County, California for its treatment of a deaf woman. The suit claims employee discrimination based on ADA law took place in 2005. The County failed to hire Lee Ann Unchangco to work in social service despite receiving high marks in her interview. During a second round of interviews, it was made clear to her that she would not be hired because she is deaf – despite the fact she had a decade of experience in the same position that earned her high praise in Los Angeles County. The EEOC investigation concluded the county admitted the only reason Unchangco wasn't hired was because she is deaf. A Ventura County attorney says it was right not to hire the woman after making a reasonable effort to accommodate her. The county is required to respond in writing within two months. This disorder only affects the bones in and around the ear. About one-in-ten of those who contract the disease will suffer progressive hearing loss. Only half of 1% of the general population get it but 10% of the Anglo and Hispanic population are affected by it. It's rare among African Americans. Women come down with it twice as often as men. The most common treatment for otosclerosis is stapedotomy surgery. These are medications that can damage your inner ear. For instance, some antibiotics are "ototoxic" meaning they can impair your hearing and balance. Aspirin can even cause temporary problems. If you’re having a hearing problem, ask your doctor about any medications you’re taking. This form of hearing loss happens naturally with age. It’s a persistent ringing, hissing, or roaring in the ears. It’s frequently caused by exposure to loud noise or certain medicines. Presbycusis is a form of hearing loss happens naturally with age. It can be caused by changes in the inner ear, auditory nerve, middle ear or outer ear. Some of its causes are aging, loud noise, heredity, head injury, infection, illness, certain prescription drugs, and circulation problems such as high blood pressure. Studies indicate it is probably inherited. The 21st Summer Deaflympics program includes these competitions: badminton, basketball, bowling, cycling, football, handball, orienteering, shooting, swimming, table tennis, tennis, volleyball, beach volleyball, water polo, wrestling freestyle, wrestling Greco-Roman, karate, judo and taekwondo. The events take place from September 5-15 in Taiwan. Deaflympics begins in Taiwan tomorrow with a record 85 nations joining the competition. At the same time, the Taipei International Deaf Fair is taking place at the Taipei Arena. More than 100 art collections created by deaf artists are being displayed on the exhibit floor along with a visual history of Taiwan`s deaf associations. The theme is Deaf Culture - Taiwan Excellence. Critics are panning the new movie All About Steve. The Sandra Bullock film is getting trashed for no only being unfunny but also making fun of deaf children. In the movie, the kids fall into a well or mineshaft. A TV crew races to the scene of the big breaking story followed by Bullock. She runs across a field and winds up falling in herself, offering a teary soliloquy while sitting next to a frightened deaf girl. A series of callous deaf jokes follow. An elderly deaf woman has died from injuries she suffered during a home invasion. Police say someone broke into the house of Elouise LeJune Starks in Clarkesdale, Mississippi through a side window in the middle of the night. The 72-year-old woman was beaten after a struggled with the intruder and died while being airlifted to a hospital. The former elementary school teacher. Police are still looking for the suspect. Here’s more on the finalists for the position of president at Gallaudet University. Their current positions are listed in an earlier post. All four of the finalists are deaf and all can sign. They will each visit the campus over the next few weeks. The board of trustees will decide who gets the post next month and the new leader will take over January first. Robert Davila’s term as interim president ends in December. He was selected after the trustees withdrew the appointment of Jane Fernandes. Students protested her selection, taking over the administration building and barricading the school’s gates. Lori Mallory talks about the Air Carrier Access Act in this signed video. Dr. Stephen F. Weiner, provost, Gallaudet University. Dr. Roslyn Rosen, director, National Center on Deafness at California State University, Northridge. Dr. Ronald J. Stern, superintendent/chief executive officer, New Mexico School for the Deaf. Dr. T. Alan Hurwitz, president, National Technical Institute for the Deaf (NTID) and vice president/dean of Rochester Institute of Technology for NTID. There’s a bill in Congress that would bring closed captioning to internet video. Massachusetts Congressman Ed Markey introduced the 21st Century Communications and Video Accessibility Act of 2009. Sites like Netflix and iTunes are not required to carry closed captioning. But if the proposed law is passed, there would be a standard required for large internet video services in the US along with smart phones and other portable devices that display video. The bill, known as H.R. 3101, would not affect user-based sites like YouTube. The bill also calls for funding of research into real-time texting that would apply to cell phone communication. There are six lawmakers sponsoring the legislation. It’s been endorsed by AT&T along with Verizon. Here is more information on the bill. Among the first year medical students at the University of Wisconsin are two deaf students. There are 168 students in the class of 2013. 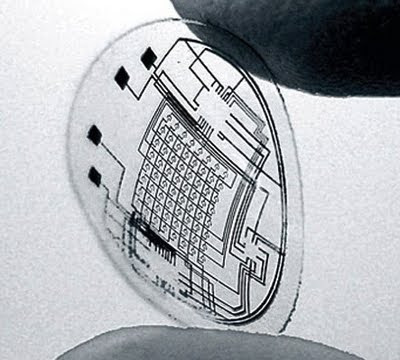 New contact lenses that display information could soon help the deaf. University of Washington scientists made these revolutionary contacts in such a way that they can give visual cues through embedded LEDs. The circuitry is transparent and works in a polymer lens that is just over one millimeters in diameter. Deaflympics has picked Taiwanese carrier China Airlines as the official airline for the 21st Summer games in Taipei. The games begin September 5 and run through the 15h. The airline will provide discount tickets and an excess baggage allowance. Cabin crews and ground service employees have been taking sign language training to help improve their service to deaf and hard-of-hearing-passengers. Travel information brochures and films with English subtitles are being included on all flights. A Cincinnati Deaf school has issued a scam alert. St. Rita's School for the Deaf says several people are going door-to-door, claiming to sell raffle tickets on bahalf of the school. They are telling potential buyers that the tickets will give them a chance to win a large sum of money or a television set while at the same time helping the school. However, administrators say the school is not sponsoring this effort and does not solicit donations in this way. If you have any information about this unauthorized effort, please call the school or notify the police. Sorenson is partnering with a well-known ASL educator. The Video Relay Service will incorporate Carol Patrie’s management training program. Sorenson will offer her five two-day courses that are based on Patrie`s The Effective Interpreting Series. These one-credit courses are accredited through the American Council on Education and focus on improving managers' skills in hiring qualified video interpreters, evaluating current video interpreters and offering career strategies. The head of a deaf services company goes to court this morning, accused of not paying an employee. Mary Moylan claims Viable president John Yeh owes her more than $7400. Another trial is set for October on the civil contract claim. The Maryland-based video relay service was recently bought by New York-based Snap!VRS. The company was recently searched by the FBI in connection with an investigation of a Florida company whose owners have been arrested and charged with conspiracy to defraud the federal government. Viable says it is fully cooperating with the investigation.